The Bar Harbor Historical Society is putting the former St. Edwards Convent, which it uses as its headquarters and museum, up for sale for $795,000. A former convent in Bar Harbor owned by a local historical society is about to go on the market for nearly $800,000. 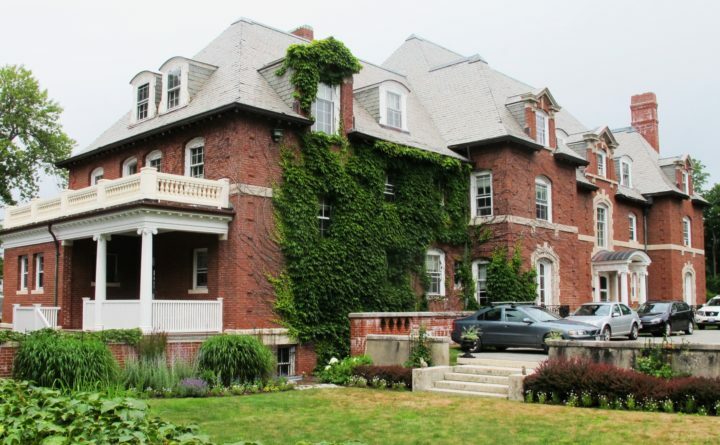 The Bar Harbor Historical Society is trying to sell the property, located at 33 Ledgelawn Ave., in hopes of generating funds it can put toward the society’s pending purchase of La Rochelle, a waterfront mansion on West Street that is on the market for $4.5 million. The historical society is hoping to purchase La Rochelle, built in 1902 and currently owned by the Maine Seacoast Mission, so it can use it to house its archives and as its new headquarters. The society is hoping to close on the mansion purchase early next month, according to a society official. “In a perfect world, a buyer may be interested in renting [the former convent] back to the Historical Society for the summer so that the museum can be there for one more year as La Rochelle is being readied for the new museum,” said Kim Swan, owner of a local real estate firm and a member of the society’s board of directors. The asking price for the Ledgelawn Avenue property, which has not yet formally been listed for sale, will be $795,000, Swan said. It officially will be on the market next week. The Bar Harbor Historical Society uses the property as its headquarters and for its museum. The property, formerly the St. Edwards Convent, was built in 1916 and deeded to Holy Redeemer Church, the Catholic church at the intersection of Ledgelawn Avenue and Mount Desert Street, according to information posted on the historical society website. The convent was built by wealthy Bar Harbor summer residents Col. Edward Morrell and his wife Louise Drexel Morrell whose sister, Saint Katharine Drexel, was canonized by the Roman Catholic Church in 2000. The brick former convent has nearly 5,000 square feet of living space and sits on a lot that is one-tenth of an acre. The historical society purchased it in 1997 for $260,000. The assessed value of the property, according to Bar Harbor’s assessing records, is $485,200.